The Constitution Select Committee (Copac) requires more than US$500 000 to print and distribute additional copies of the Draft Constitution before the March 16 referendum. In an interview yesterday, Copac co-chair Cde Munyaradzi Paul Mangwana said many parts of the country were yet to deliberate on the Draft after the available copies ran out. We were pointed to the article by biNu Zimbabwe representative, William Chui, when he notified us of a new app on their platform created to alleviate that distribution problem. 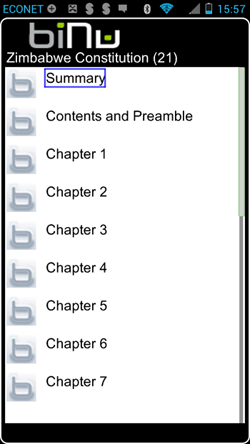 By making the constitution available on biNu, owners of feature phones (going up to the smartest phones available) in Zimbabwe can easily access it by installing the small java application. biNu uses cloud based optimisation technologies to compress data so that it doesn’t cost users as much it would using other technologies (downloading a pdf, or viewing it on a website) and also so that the users still loads something even when the network is poor. biNu says its technology is 10 times more efficient than regular mobile browsers. 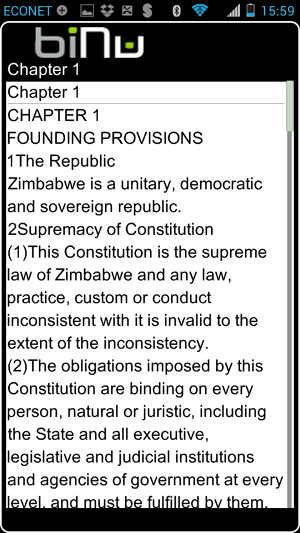 If you are reading this and would like to access the constitution on biNu, just go to App Catalog -> News & Blogs -> Africa -> Zimbabwe -> Constitution. If you don’t have biNu, you can download it on binu.com. Now this is convenience well done biNu!!! im reading it on binu. Good move. is this from the app itself because from the browser l cannt find it! You need to download (if you haven’t done so already) and open the App. If you are in Zim click the orange News Icon, click Local News, and scroll to the bottom. If you are outside of Zim click News, Africa, Zimbabwe and scroll to the bottom. You see what happens when people with actual brains meet a problem? The millions of $$$ wasted in printing the millions of forms in Zim could be saved with a single person’s light bulb moment…next, online passport applications. Brilliant idea! Thank you for sharing this, I hope it’s short enough!